The Mississippi state seal identifies government buildings and officials. The symbolism, history and emblems of the seal are described in this article with fast facts and information. The American eagle takes center stage of the seal. The modern, stylized image of the eagle was designed in 1996 and does not show its talons but still shows three arrows and an olive branch . In the original depictions of the eagle, such as that shown on the territorial seal, the talons of the eagle grasp an olive branch symbolizing a desire for peace and also arrows representing the power to wage war. 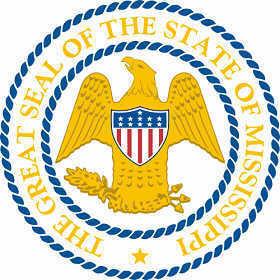 The Mississippi seal is kept and used as required by the Constitution and laws of the state. 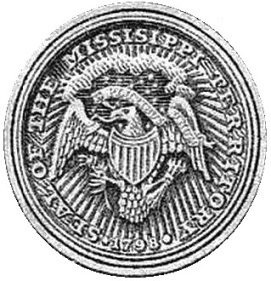 This is a flyer depicting the 1876 design of the Mississippi seal. The soldiers are wearing the clothes of the militia in the 1700's worn during the American War of Independence (1775–1783). The other image depicts slaves working in the cotton industry and carrying bales of cotton to the cotton press that is pictured in the background. Mississippi Official Nickname "Magnolia State"